Bulk set of custom embroidered mens or ladies everday cotton handkerchiefs. Bulk set of custom embroidered mens or ladies everday cotton handkerchiefs. Fantastic for corporate gifts, events or special occasions. Popular for table settings at weddings, Brand names and logos, annoucements. 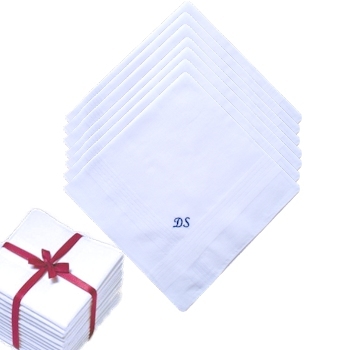 Classic white 100% cotton standard mens or ladies handkerchiefs you can choose to have them personalised with initials, a name or brief message. Just fill in the option box and choose the font style and colour of embroidery thread you would like. These come simply bulk stacked and bundle tied. You can add the option for each handkerchief to be in a presentation organza gift bag. If you would like a quote for a company logo, special motif, specific font style or additional wording please contact us with your requirements. Please allow 4-5 days for this personalised orders to be dispatched as they are made to order by Amys Gifts.